If you are a Magento 2 merchant, Mirasvit offers an excellent opportunity to launch a fully featured affiliate program for your store. Thus, you can eliminate the necessity to use third-party services reducing the need to pay fees. Having installed the Mirasvit Affiliate Magento 2 extension, you increase sales by utilizing alternative channels covered by your affiliates. Note that the module provides 4 promotion types, so affiliates can choose the most appropriate one. Below, we describe the extension’s functionality in more details. If you want to implement a fully featured affiliate program on the basis of your Magento 2 website, Mirasvit Affiliate introduces the best opportunity to do so. You only have to purchase and setup the extension. No additional fees are charged! 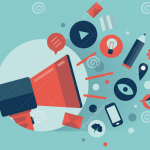 As for the mentioned above 4 types of promotion, they are: Pay Per Sale; Pay Per Click; Pay Per Lead; and Pay Per Impression. 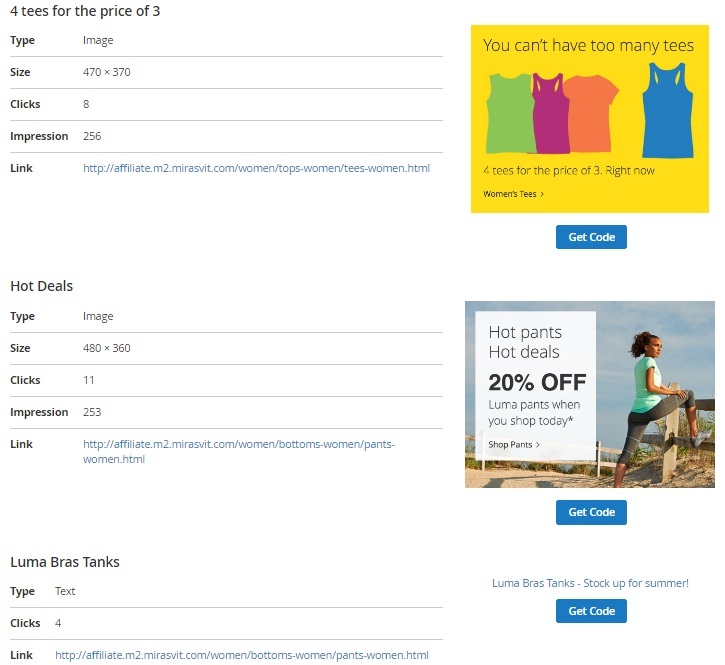 Furthermore, you affiliate get 4 different objects they can place on their websites: links, banners, widgets, and coupons, which are more than enough to choose one that suits their ecommerce needs. The simplicity of the extension is impressive: it is necessary to create an affiliate program, define a withdrawal lower limit, and add some creatives. Now, you start to drive extra revenue to your Magento 2 website and let your partners get some extra money. The extension provides your affiliates with information about all available programs and their conditions right at the welcoming dashboard. After deciding on the most suitable program, they should choose a creative, and the Affiliate extension provides an HTML code ready to be embedded into a website. Note that widgets are highly customizable. It is also necessary to mention that the tool provides your affiliates with clear and transparent transactions history. 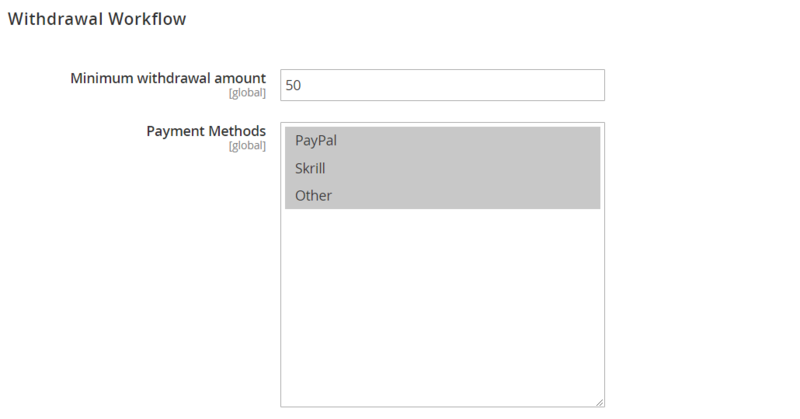 Besides, there is an easy withdrawal procedure that incorporates PayPal, Skrill, and Store Credit Account. As for the backend functionality of Mirasvit Affiliate for Magento 2, it is described below. The Dashboard of the Affiliate extension provides information about the number of affiliates who were active within 7 days, the total number of affiliates, visits for the last 7 days, as well as revenue and commissions for the same period. Below, there is a grid with the most valuable affiliates (Affiliate; Total Earning; Clicks). The right part of the page illustrates the latest activities. Statistic (number of clicks, leads, views (Impression), and sales). As for the Transactions tab, it contains a grid with details on the affiliate’s transactions: ID, affiliate emails, amount, type, description, status, and dates of holding, creation, and update. Another grid is available in Withdrawals. 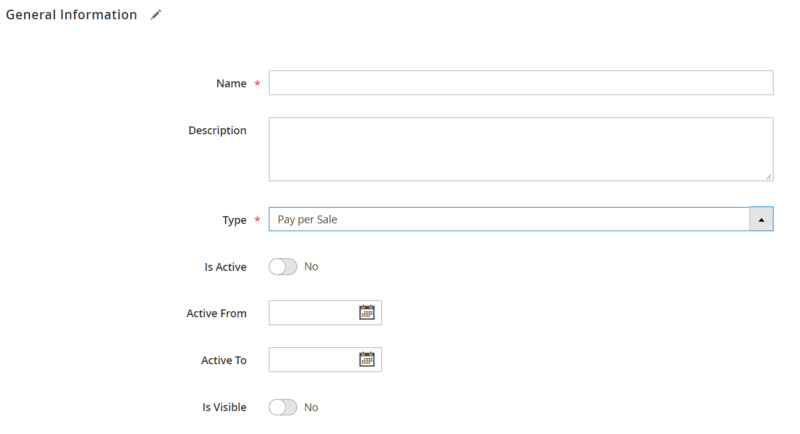 It consists of 7 columns: ID, Affiliate, Amount, Fee, Request Date, Type, and Action. In Referred Customers, the appropriate grid contains the information on IDs, names, emails, and actions of the customers who were referred by the affiliate to register on your website. It is possible to add selected customers manually here by clicking the “Add Customers” button. All affiliate programs are gathered in a grid as well. In this case, it contains the ID, Name, Description, Type, Is Active, Active From, Active To, Is Visible, and Action columns. Note that the 4 programs you see in the grid are provided by the Affiliate extension right after installation. To add a new program, first, you need to enter its name and description and choose a type (Pay per Sale, Pay per Lead, Pay per Click, or Pay per Impression). Next, activate the program, select a time interval for it (optional), and enable/disable its visibility. The next section of the same page lets you create an unlimited number of tiers defining a commission type (percent of order amount or cart amount or fixed amount) and amount. As for transactions, you can view all of them in a grid that consists of 9 columns: ID; Affiliate; Amount; Type; Description; Status; Hold To; Created At; Updated At. The data provided in this grid is the same as in the Transactions tab of the account view page. The same is about the Withdrawals grid. 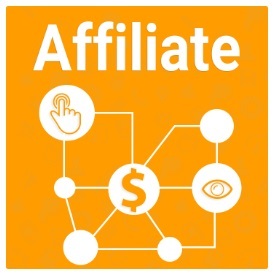 It consists of the same 7 columns as the grid described above in the affiliate’s account: ID, Affiliate, Amount, Fee, Request Date, Type, and Action. As for the Banners grid, it is divided into 7 columns: ID, Preview, Title, Type, Is Active, Statistic (number of clicks and views), and Action (Edit, Delete). 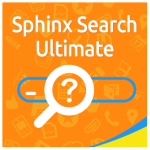 To add a new banner, specify its title, choose a type (Image or Text), and activate the banner. 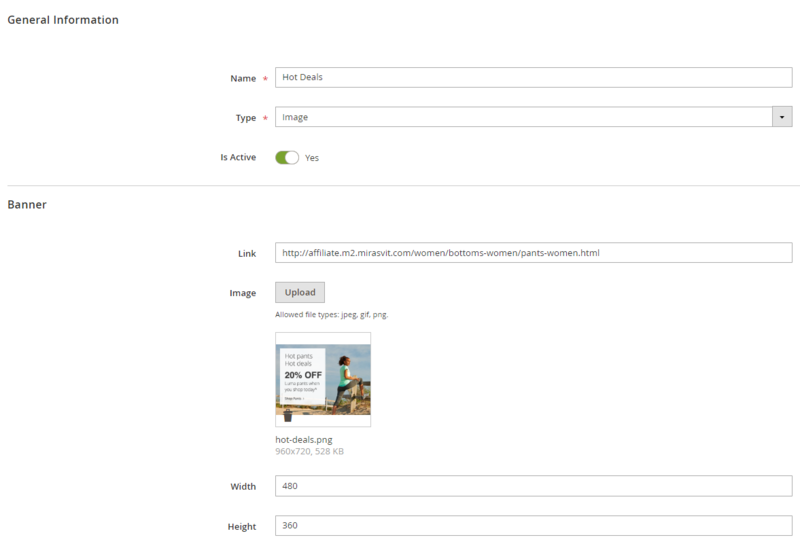 For the image type, add a link, upload a file, and set width and height. 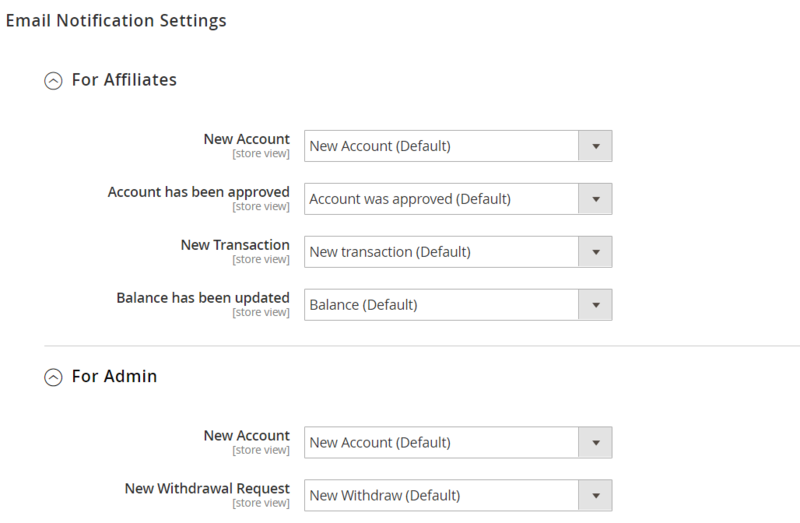 Now, let’s have a look at the extension settings which are divided into 5 subsections: Account, Commission Workflow, Withdrawal Workflow, Coupons, and Email Notification Settings. In Account, you can enable/disable the following options: Auto Sign Up after create account and Approval is required. Also, specify a links referral parameter here. 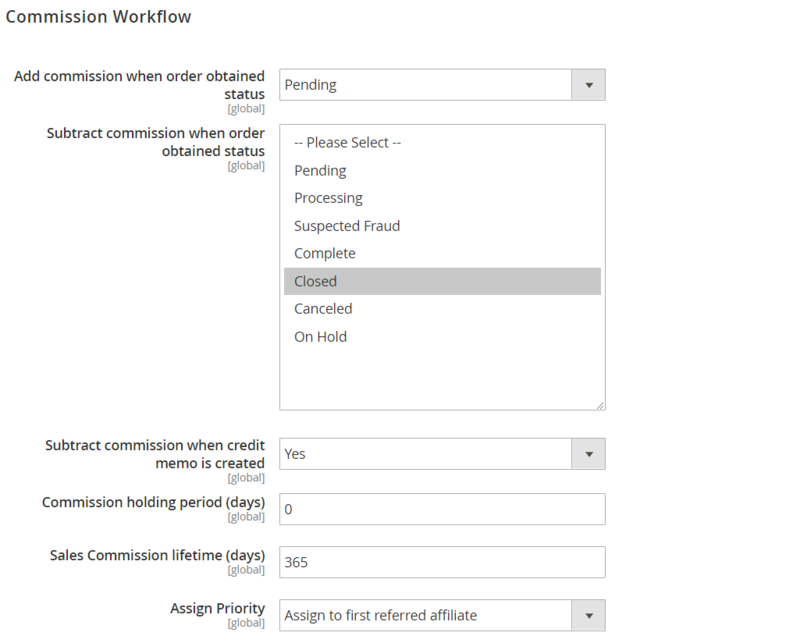 Commission Workflow provides the ability to fine-tune the extension even more. You can choose when to add and subtract a commission, as well as specify a commission holding period and lifetime and assign the priority (whether to the first or last referred affiliate). In Withdrawal Workflow, you need to specify the minimum withdrawal amount and available payment methods. 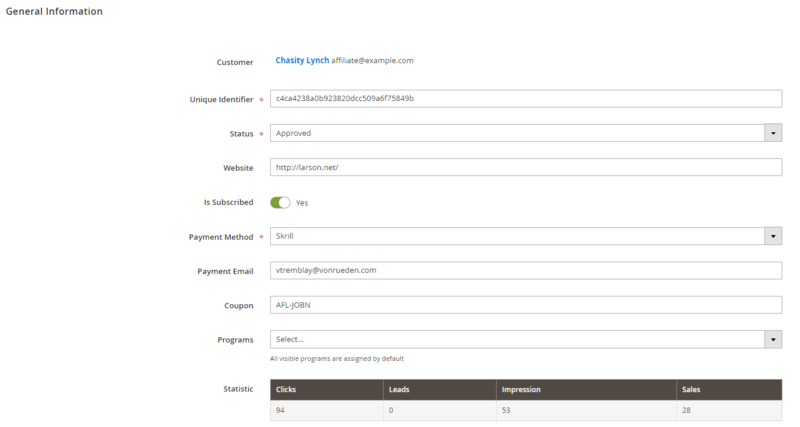 In the Coupons tab, you can enable/disable usage of coupons by affiliates and specify a coupon pattern. Email Notification Settings for affiliates contain the following options: New Account, Account has been approved, New Transaction, and Balance has been updated. As for admins, they can get notifications when a new affiliate account has been created, and a new withdrawal request has been submitted. From the perspective of an affiliate partner, the extension looks as described below. In Statistics, your affiliate partners can track the number of clicks, leads, orders, and views on their promotional materials, as well as the earned sum within the specified time interval. In Settings, you specify a referring website, subscribe to email notifications, and set up withdrawals (choose a payment method and enter a payment email). Supports the most popular affiliate rewards. Advanced options for creatives (banners, links, widgets). Intuitive backend with simple commission settings. Ability to withdraw money from Store Credit Account. 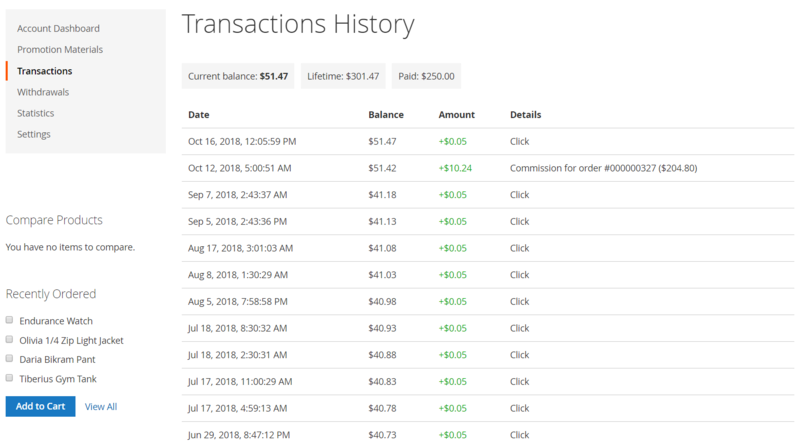 Transactions history at a glance. Mirasvit offers a great alternative to various third-party platforms. If you are going to implement a fully featured affiliate program on the basis of your Magento 2 website, give the extension a try. Mirasvit Affiliate for Magento 2 not only offers all necessary features aimed at creating a chain of reliable partners but also eliminates all additional fees from the process: you just have to purchase the module for $149 (right now you can get it with a discount for $119 only) and send remuneration to affiliates.